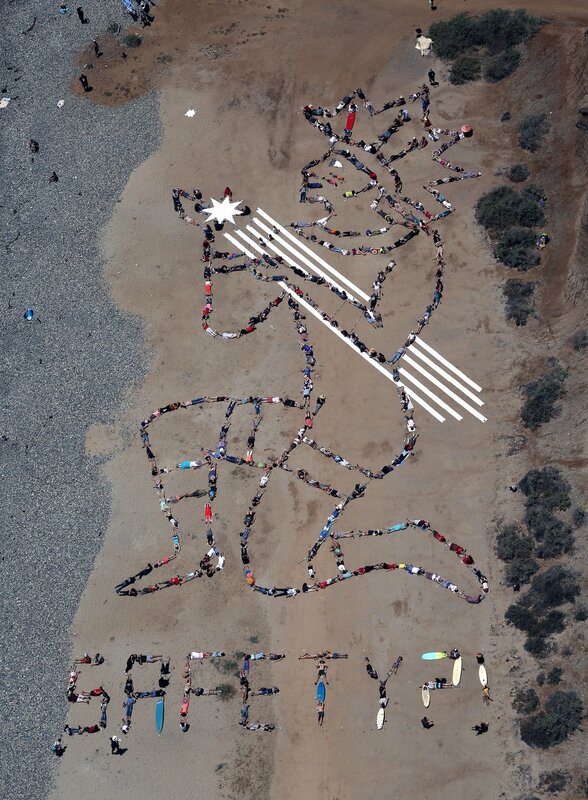 On Saturday June 9, the Juaneño Band of Mission Indians, Acjachemen Nation, conducted a peaceful ceremony and massive Aerial Art display created by internationally renowned Aerial Artist, John Quigley, with video by award-winning director and film maker Kurt Soderling. The Aerial Art display, which could only be seen from the air, was made entirely of human bodies and surfboards by beach goers and members of the Acjachemen Nation. The event, titled Acjachemen Wisdom Day, and sponsored by Public Watchdogs, is designed to draw international media attention to the fact that deadly radioactive nuclear waste waste is being buried in beachfront concrete silos on sacred burial grounds 108 feet from the crashing surf and sparkling sugar sand beaches at the San Onofre Nuclear Waste Dump in Northern San Diego County. 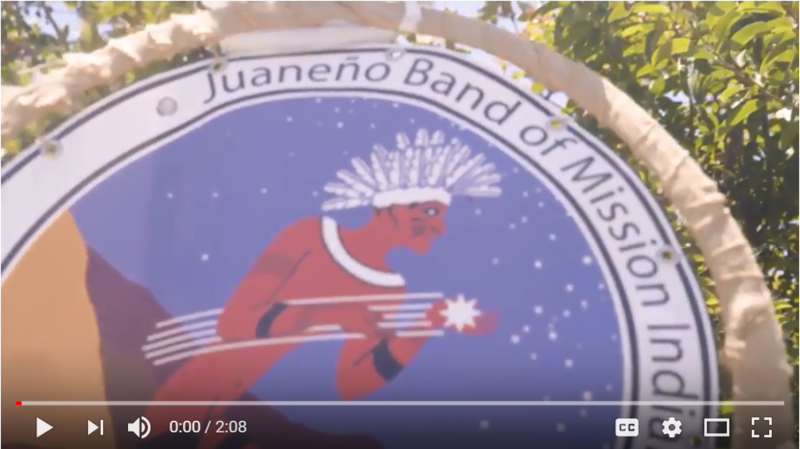 The Juaneño Band of Mission Indians Acjachemen Nation and hundreds of concerned citizens gather to form their ancestral “Star Man” and the word “SAFETY? 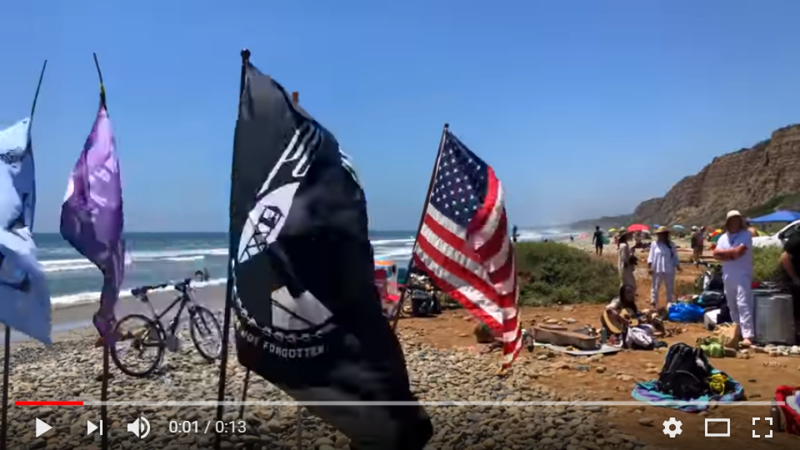 !” on San Onofre State Beach on June 9, 2018. The human banner was meant to shed light on the decommissioning process of the nearby San Onofre Nuclear Power Plant which organizers say could have a devastating impact on Southern California and future genterations. The event was part of the Acjachemen Wisdom Day celebration supported by Public Watchdogs. Handout/Lou Dematteis/Spectral Q. For a higher resolution image, click here. Click here for a cropped higher resolution image. 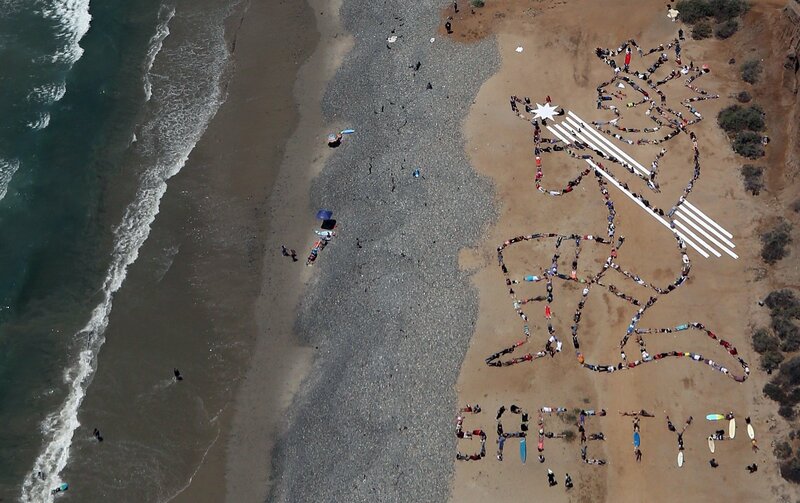 With the shuttered San Onofre Nuclear Power Plant in the far background, members of the indigenous Acjachemen Nation and hundreds of supporters create a human banner reading “SAFETY? !” on San Onofre State Beach on June 9, 2018. The participants are calling for the safe containment and removal of the nuclear waste generated by the plant. The event was part of the Acjachemen Wisdom Day celebration supported by Public Watchdogs. Handout/Lou Dematteis/Spectral Q. For a higher resolution image, click here. More than three million pounds of plutonium and uranium waste are being stored at San Onofre fewer than 108 feet from the beach. The waste is deadly for at least 250,000 years. A single pound of plutonium is so toxic that it could give everyone on the planet cancer if it was spread evenly over the surface of the earth. Warranty documents obtained by the advocacy group San Onofre Safety show that the storage cans at San Onofre are only guaranteed to last 25 years. 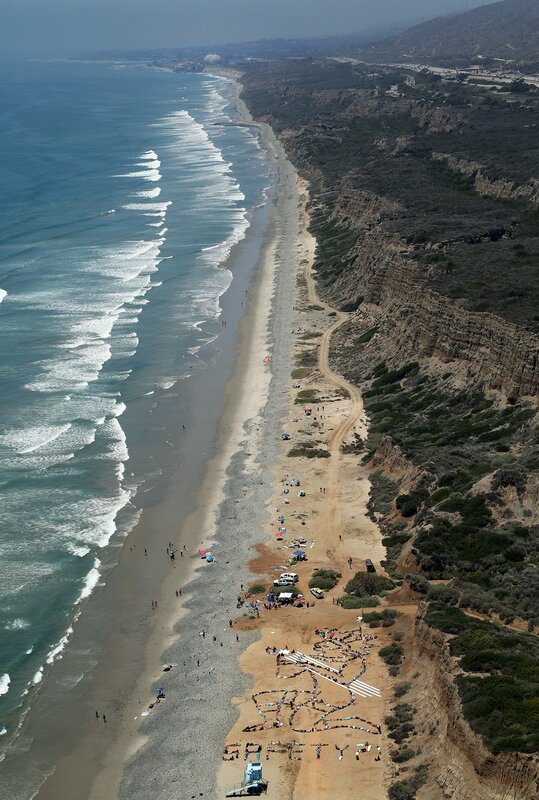 Each of the 72 cans at San Onofre contains as much radiation as what was released during the Chernobyl disaster. Currently, the deadly radioactive waste is being stored in delicate stainless steel trash cans made of thin-walled 5/8” thick stainless steel 108 feet from the beach that was the birth place of American surf culture. Geologically unsafe: According to Public Watchdogs’ Geologist, Robert Pope, the risk of a nuclear incident at San Onofre is unavoidable, given the area’s fragile geology. 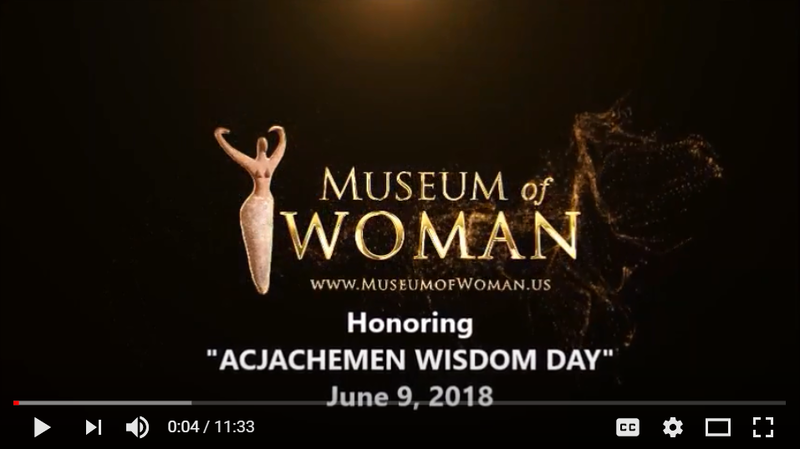 For more information or to arrange interviews with Acjachemen elders, artist John Quigley, or event organizers, contact Charles Langley at (858) 752-4600.